Hello true believers and comics lovers. 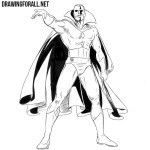 The team of Drawing For All welcome you on the drawing lesson about how to draw Mister Sinister from Marvel. Mister Sinister, the real name is Nathaniel Essex, a character, super-villain of the Marvel Comics universe, created by Chris Claremont and Marc Silvestri. In the first step we usually draw the skeleton of the character, so as not to encounter difficulties with proportions in future. First of all we need to sketch out the head in the form of a simple oval. Next, we sketch out the spine in the form of an simple line. On this very line draw the thorax in the upper part and the pelvis in the lower part. At the end of the step sketch out the arms and legs with the help of usual lines. Sketch out a neck in the form of a cylinder and torso with a very wide shoulder girdle and a narrow waist. Next, with the help of circles draw the deltoid muscles. Below them draw the outlines of the upper and lower arms and also the fists. Sketch out the triangle pelvis under the torso. 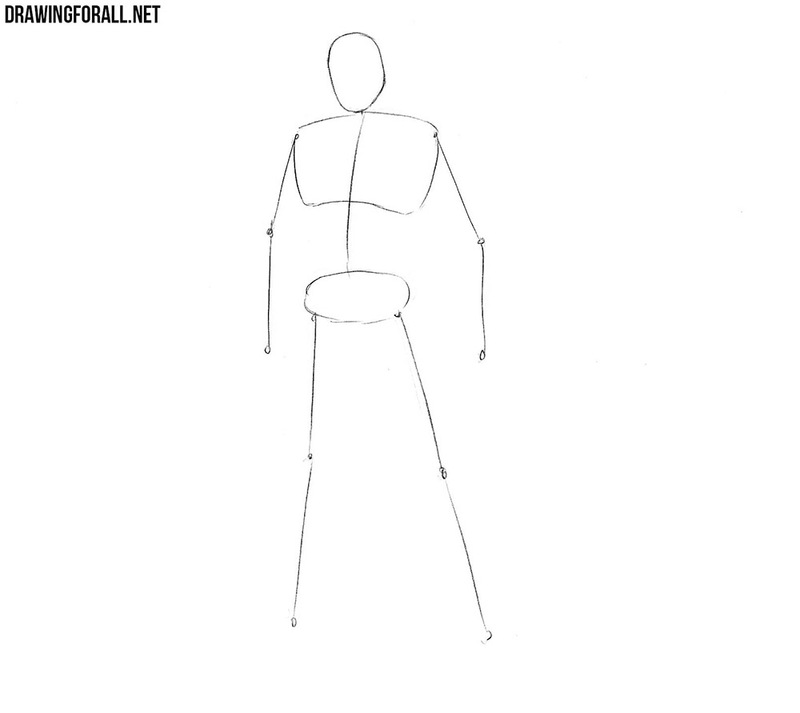 Next, outline the legs tapering in the knees and ankles The knees are sketched out in the form of usual circles. In the third step we usually draw the basic details. This lesson will not be an exception. Let’s start with the top and draw the outlines of the hairstyle and facial details. Next sketch out a high collar (similar to the Morbius collar) and long strips behind the back. 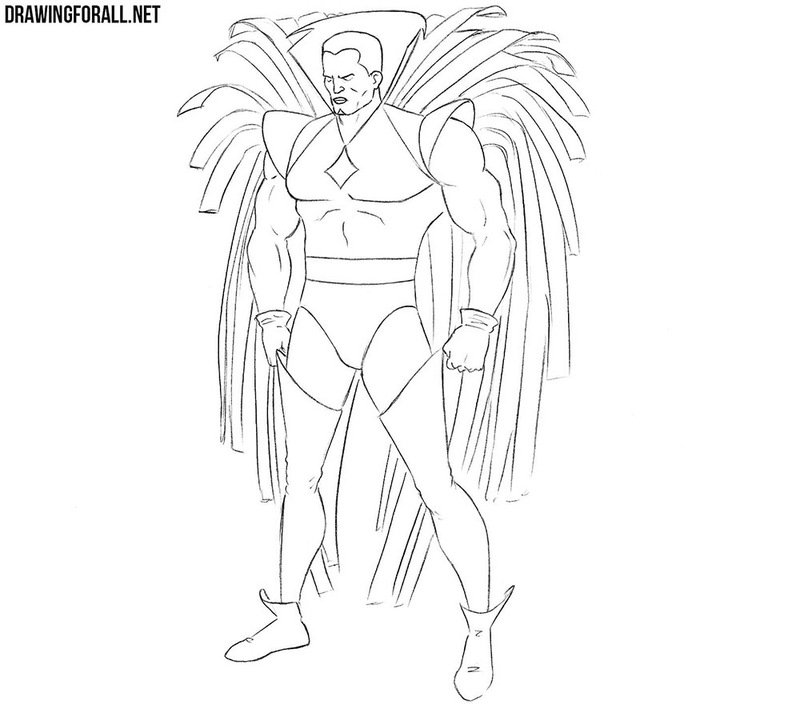 At the end of the step draw the outlines of gloves, high boots and rhombus in the center of the chest. Starting with this step we will deal with the final details and, as always, start from the top and move down. Carefully draw out the outlines of the hairstyle. A little below draw the eyes, nose and mouth. Then draw out the shape of the cheekbones and jaw. Do not forget to draw a couple of wrinkles on the face and a small beard on the chin. Using clear and dark lines draw out the contour of the torso, which as we have already said, is very broad at the shoulders and narrow at the waist. 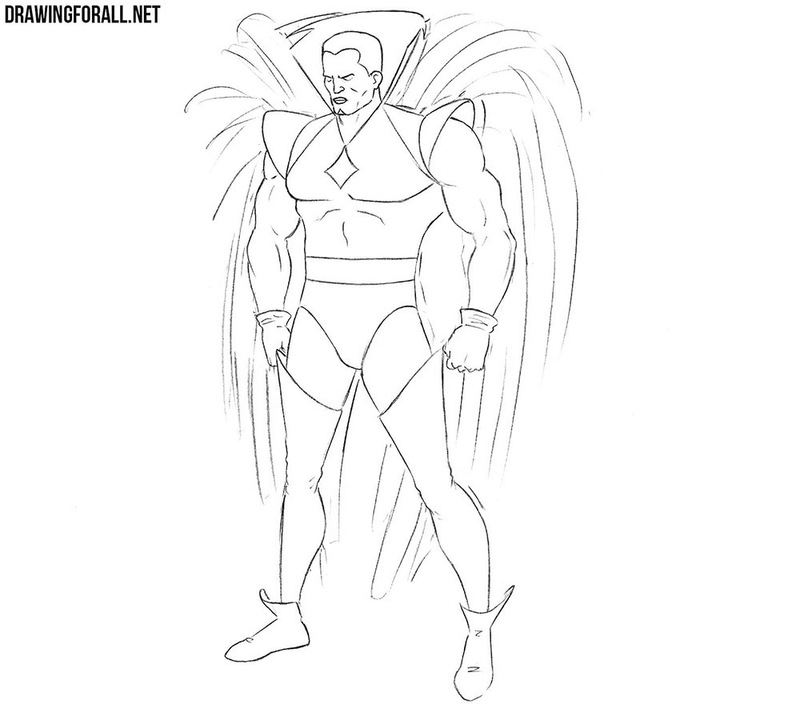 Draw the wide pectoral muscles, the muscles of the abdominal and all the details of the costume, as in the example below. 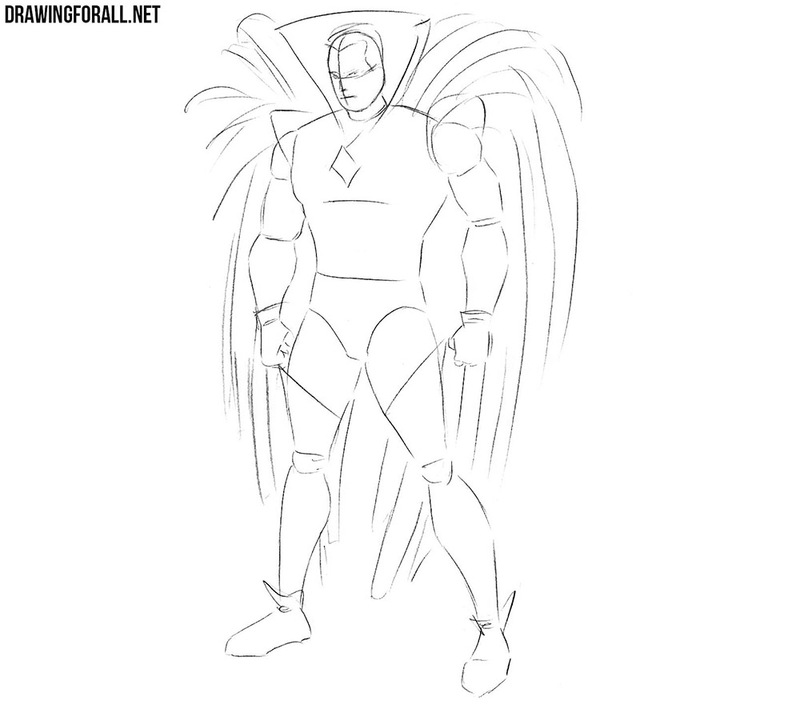 Now let’s move to Mister Sinister’s arms. First draw out the large and round deltoid muscles. 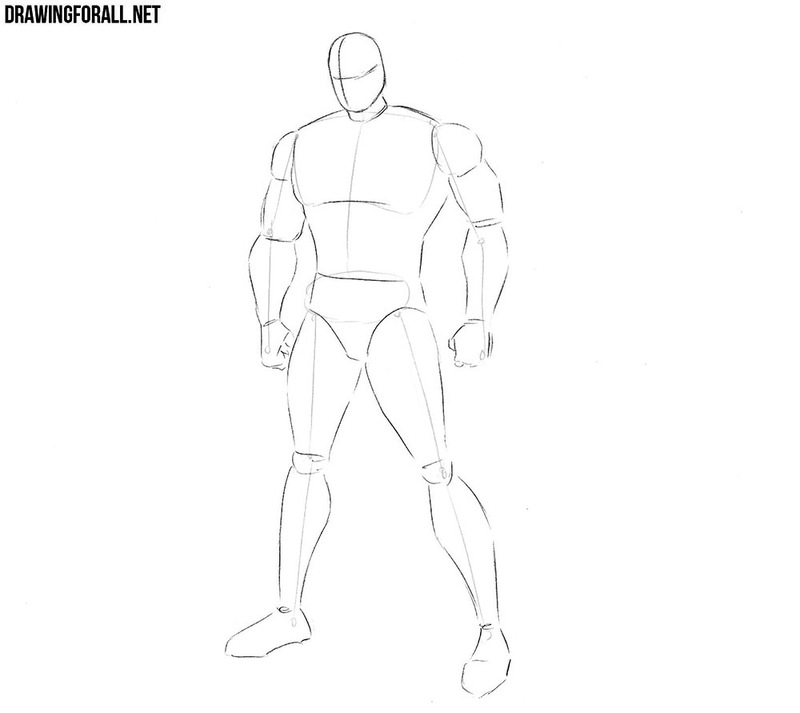 Further draw out the outlines of the big biceps and triceps. A little below draw out the muscles of the forearms tapering to the wrists. Draw out hands in gloves (to learn more about the hands, visit the lesson on how to draw hands). It remains to draw the lower part of Mister Sinister’s body. Draw out the shape of the pelvis. Next, carefully draw out the outlines of the legs and high boots. Erase all unnecessary guidelines and add folds as in our example. Continue the drawing tutorial about how to draw Mister Sinister. Now it’s a painstaking step. 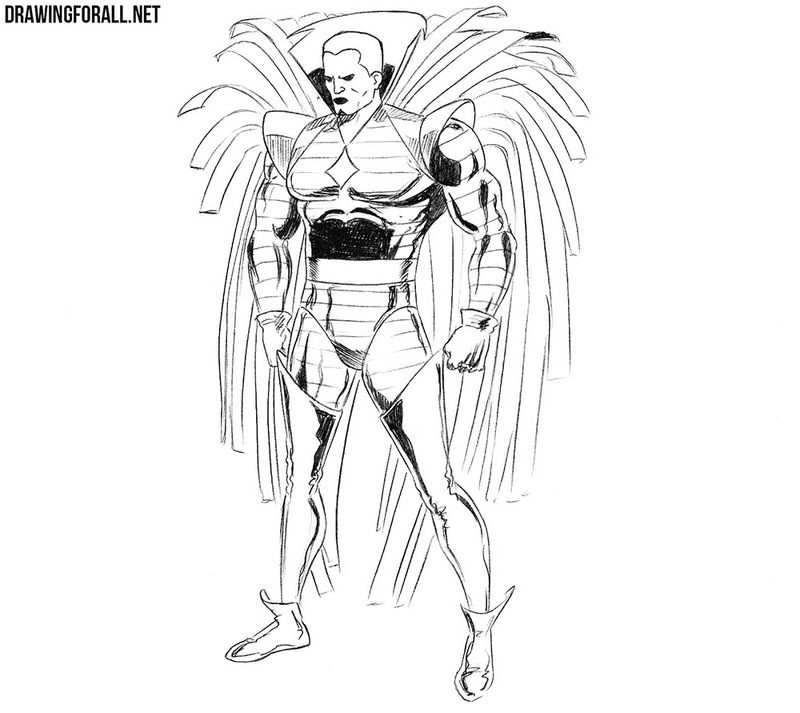 Here we will need to draw out all the stripes behind Mister Sinister’s back. 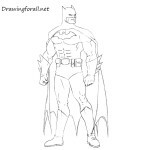 Now we have only to draw the longitudinal lines on the costume and shadows. Shadows consist of two parts. The darkest and thickest shadows look like large black areas. Slightly less dark shadows need to be drawn with hatching. Recall that you can draw out the drawing with a liner and even paint over it. 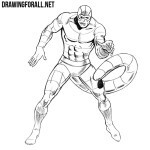 We are very happy that our lessons help you learn how to draw like real comic artists. Also we will be very happy if you subscribe to us on social networks and share our tutorials with your friends.